Tune in for everything you wanted to know about the creation and management of a successful Twitter chat! Julia McCoy created and launched Twitter chat #ContentWritingChat in January 2016, hosted by her agency account on Twitter, @ExpWriters. It quickly grew to #40 and #20 on Twitter in the next few months, and in six months, it hit the trending sidebar on Twitter. 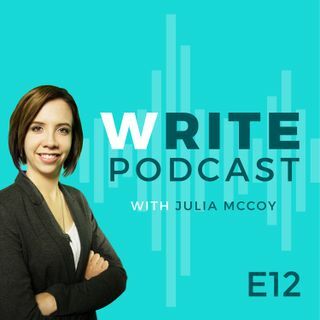 Rachel Moffett, the social media manager at Express Writers, joins Julia to share how she continues to manage the chat every week, ... See More set up reminders to boost engagement, and the secrets of ongoing success that keep it hot. (Hint: it's simple, but elbow grease is involved!) Julia and Rachel answer a big question as well: Do you need 5000 followers to launch a successful Twitter chat? The answer might surprise you. *See more podcast episodes at https://expresswriters.com/write-podcast/. *Read Julia's blog at www.expresswriters.com/write-blog. *Buy Julia's new bestseller: http://bit.ly/juliamccoy.